CWAers at AT&T Midwest and AT&T Legacy T are standing up against corporate power and fighting for good jobs and a fair contract at AT&T. 14,000 AT&T workers covered by AT&T's Midwest and AT&T Legacy T contracts have voted to authorize a strike if AT&T refuses to offer real solutions at the bargaining table. A new video featuring CWA members exposes how AT&T is making a massive profit from the Republican corporate tax cut bill, while at the same time laying thousands of workers off and outsourcing U.S. jobs to low-wage contractors. Watch the video here. "I think AT&T cares about numbers and profit and money going to the executive officers and stockholders. They don't care about the employees," said David Blackburn of Tempe, Ariz., a member of CWA Local 7050. 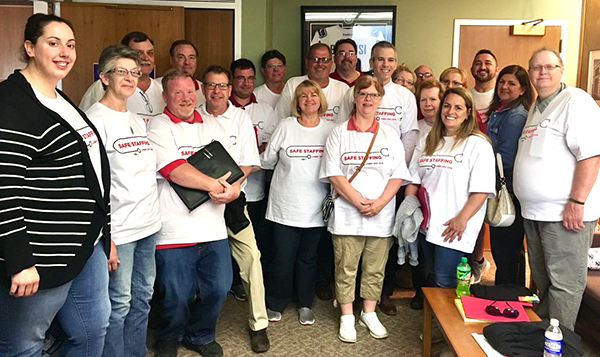 On Saturday, more than 100 CWAers from across the Midwest gathered to welcome and rally with the CWA bargaining committee in Arlington Heights, Ill., where negotiations are continuing with the company. The parking lot and sidewalks were overwhelmed by a flood of red shirts, sending a message to AT&T that members are ready to fight for a fair contract. Members of the Windsor Typographical Union/CWA Canada Local 30553, which represents more than 100 employees in the Windsor Star mailroom, successfully fought off demands for major concessions, overwhelmingly voting to ratify a tentative agreement with Postmedia. The same members had, in January, sent a clear message of defiance to Postmedia with a near-unanimous strike vote. "While we didn't make a lot of gains, we stood firm against deep concession demands and that is a big victory," CWA Canada President Martin O'Hanlon said. "Our members have protected pension contributions and maintained their health benefits, showing the advantage of standing united in a union." 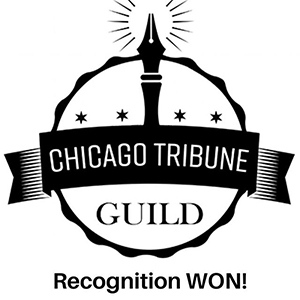 The Chicago Tribune Guild reached a historic agreement with Tronc, Inc., on Sunday for the media company to voluntarily recognize the journalists' union after more than 85 percent of eligible employees signed cards signaling support for joining NewsGuild-CWA. The union recognition includes employees at the Chicago Tribune as well as at several suburban Chicago newspapers and the newly formed Design and Production Studio. Given the 170-year-old Chicago Tribune's history of anti-union sentiment, the deal is especially notable. With voluntary recognition, legal protections for all of the included newsrooms take effect immediately. In a letter sent to colleagues Sunday evening announcing the agreement, the Guild's organizing committee stated that "in the face of pernicious corporate influence on our industry, we need a better way to advocate for our work, protect the future of our and the next generation's journalism careers and strengthen our coverage of Chicago." CWA members and allies continue to put pressure on corporations to stop sending call center jobs overseas. Senator Bob Casey (D-Pa.) and nine other Democratic Senators sent a letter last week to President Trump calling on him to take executive action and support legislation to help rein in offshoring and bring call center jobs back to the United States. Many of the same Senators alerted President Trump to the need for action last year, but instead of working to reduce offshoring, the Trump Administration backed provisions in the Tax Cut and Jobs Act that provide incentives for corporations to send jobs overseas. Many of the companies that are the biggest beneficiaries of the Republican tax bill, including AT&T and Wells Fargo, have been closing American call centers and aggressively offshoring U.S. jobs, especially in the call center and customer service industry. To help stop this harmful offshoring, CWA supports federal call center legislation, backed by ten Senators as well as a bipartisan group in the House, that would make U.S. companies that offshore their call center jobs ineligible for certain taxpayer funded grants and loans. The bill would give U.S. consumers a right to know where they are calling and to be transferred to a U.S.-based location, and create a public list of companies that offshore call center jobs. Call center workers and supporters from across Colorado gathered at the State Capitol in Denver to lobby for HB18-1435, a CWA-backed bill to protect call center jobs. Many CWAers spoke personally with their own representatives, who expressed interest in and support for the legislation. CWA members from Local 7750, Mimi Mahdi, Greg Caren, and Riley Emmons, along with Dustin Sullivan from Local 7702, testified in support of the bill at a House Finance Committee hearing. Listen to audio from the hearing, including Representative Daneya Esgar (D-Pueblo), the bill's sponsor, speaking about the need to protect call center jobs. 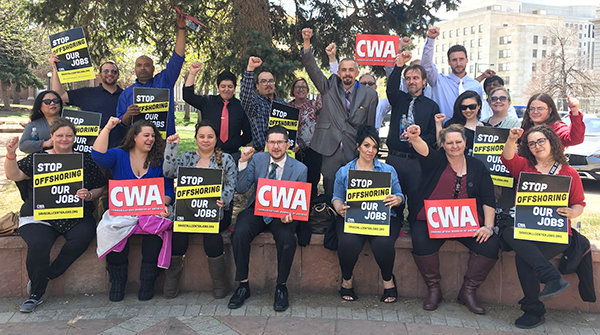 CWA call center workers and supporters from across Colorado gathered at the State Capitol in Denver to lobby for legislation to protect call center jobs. A bill introduced by Louisiana Senator Troy Carter and supported by CWA giving the state the ability to claw back tax incentives when corporations don't keep the employment promises they make has made major strides towards becoming law. The bill was spearheaded by CWA members in order to crack down on call center employers that utilize state tax dollars and then move the work out of state. The bill, supported widely by both Democrats and Republicans, cleared the State Senate on a unanimous vote, and cleared the State House Ways and Means Committee. The State House is expected to vote on the bill this week or next, and Louisiana Governor John Bel Edwards is expected to sign it, once passed. 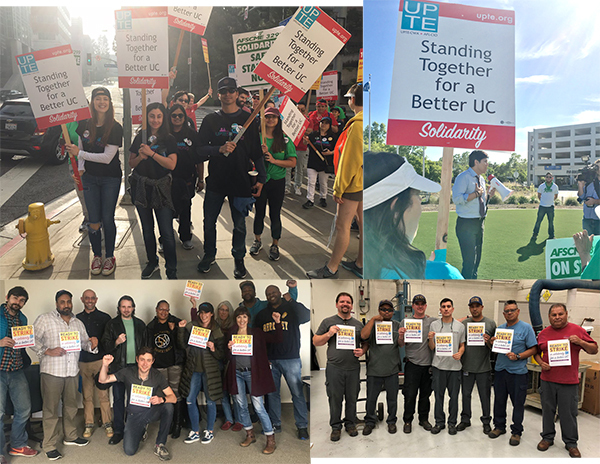 This week, UPTE-CWA Local 9119 went on strike in solidarity with AFSCME members who are on the picket lines fighting for a fair contract at the University of California. UPTE members share the same concerns about gender and racial equality at the University. Top right: State Senator Kevin de León, the CWA-endorsed candidate running for U.S. Senate against incumbent Senator Dianne Feinstein, joined CWA members on the picket line. 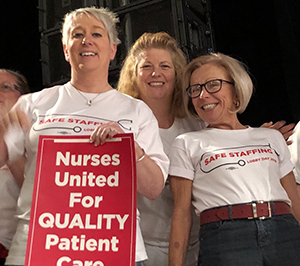 This week, CWAers, including nurses and supporters from upstate New York, joined a coalition of members of PEF, NYSNA, 1199, Senior Action, and NYSUT for a Health Care Workers Lobby Day at the State Capitol in Albany to urge elected officials to pass legislation to set safe staffing ratios. Nurses across the state are currently being forced to take care of nine, ten, or even more patients at a time. When that happens, patient care suffers. In order to stop putting New York patients at risk, legislators should pass the Safe Staffing for Quality Care Act (S.03330/A.01532). CWAers from Local 1122, 1126, 1133, and 1168 (top) participated in a Health Care Workers Lobby Day in Albany. Starting next week, tens of thousands of people across the country will participate in nonviolent direct actions to fight back against the structures that are undermining our democracy and supporting economic injustice. This renewal of the Poor People's Campaign, comes 50 years after Dr. Martin Luther King, Jr., first put forth his vision of a multi-racial movement to address the root causes of poverty. CWA's Human Rights Growth Fund is supporting work with the Poor People's campaign. "The challenge that the Poor People's Campaign puts before us could not come at a more critical time," said CWA President Chris Shelton. "Are we committed to working to fulfill the promise of our democratic traditions, toward a more equal and just society? Are we ready to listen to the voices of those who have been disenfranchised and silenced as they call on us to build a better future?" The 40 Days of Moral Action will culminate in a mass rally in Washington, D.C., on June 23rd. The journalists of the Denver Post and other newspapers owned by Alden Global Capital have had enough – they're now in open rebellion against the "vulture capitalist" hedge fund. On May 8, reporters, photographers, and other newsroom personnel from Denver, St. Paul, the Bay Area, Philadelphia, and Kingston, N.Y., many of them members of NewsGuild-CWA, converged on the sidewalks outside Alden's New York City headquarters, where they picketed, chanted, and gave speeches on bullhorns. They demanded that Alden invest in the papers it owns or sell them to someone who will. The hedge fund owns controlling shares in Digital First Media, the country's second-largest newspaper chain, and despite earning far higher-than-average profits, the papers have been laying off staff at twice the industry rate. "They don't understand what they own. Newspapers are a public trust, and they don't understand that," Pulitzer-Prize winner Thomas Peele of the Mercury News told the crowd. "Before they took over there were six reporters covering the county I work in – now I'm the only one left," Nick Ferraro, a reporter at the St. Paul Pioneer Press said. Reporters, photographers, and other newsroom personnel, many of them members of NewsGuild-CWA, rallied outside Alden's New York City headquarters, demanding that Alden invest in the papers it owns or sell them to someone who will.